Farmers Way of Life: Sometimes even no clouds has a silver lining. Part 2. Sometimes even no clouds has a silver lining. Part 2. 2007. A new year. A much anticipated new year. Forget 2006, that's one we will wipe from our memories. Learn what we can from it and move on. This year is our year. We'll pick up where we let off in 2005. Our new feedlot is going gangbusters with the shippers, now all we need is a reasonable season and we'll make some ground back. As some bright spark once told me, it always rains after a drought. What that wonderful piece of wisdom forgets to mention is that it always blows before a rain. loads out of the house afterwards. There is a reason the trees grows sideways here. The same reason a fifty something turbine windfarm is built right next to our place. Also the same reason pilots landing in Geraldton call it running the gauntlet. What some might call a gale we call a sea breeze. From about November to April the wind blows. And blows. Easterlies in the morning and South Westers in the evening. It can be relentless. And after 2006 the last thing we needed was a record breaking day of wind. But blow it did. A cyclone was coming down and it was going to be a beauty. Bring it on we said. As I watched everything blow away I consoled myself with the fact at least it was going to rain. Yup, bring on the rain...... anytime now, my neighbour is getting my paddocks. Where's the bloody rain? Two days later the wind stopped and we were left with two farms that can only be described as the Sahara. And not a drop of water had hit the ground. You know when you jam your hand in something and it really really hurts, but you're not game to look? You know it's going to be bad, but you also know it's going to hurt more when you see the damage. That was how we all felt as we ventured out to survey the carnage. What a bloody mess. All down the road driving to the other farm we could see it wasn't going to be pretty. Fences laid over with straw and tumbleweed piled up against them. Some sections of road were covered in drift sand. Then we came over the hill and saw the bright white light. Turns out it wasn't a light, it was the reflection off our sun bleached paddocks. The Back paddock, or what was left of it. Driving up the driveway was heart breaking. Nearly all our brand new fencing had been buried in drift. In some sections you could have driven into the next paddock without opening a gate. 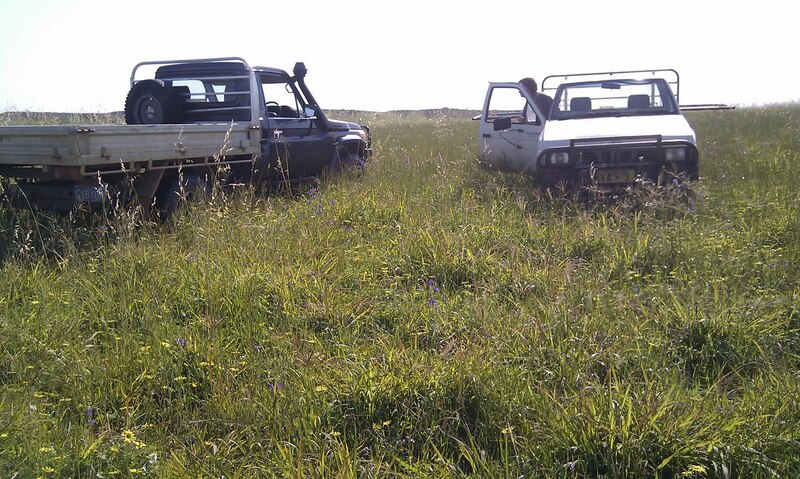 The stock were OK, we are lucky enough to have some remnant bushland in the paddocks they were in. Apart from a few dusty eyes they seem alright, but what little feed they had left was now gone. Apart from one windmill there was no structural damage to any buildings, but the damage to the topsoil was scary. How the hell is anything going to grow here now? We had another month or so before any rain was due, so our days were filled with feeding sheep, keeping the feedlot going, which thankfully was busy and provided a good income, and grading sand off the fences. We planned to put a crop in again, but on a smaller scale and only the lupins would go in dry. Just in case, but what are the chances of 2006 ever happening again? Better than average, as it turns out. ANZAC day came and went, and tractors started moving again, though not at the frenetic pace of norm. People had a scare and were reluctant to get carried away. But, as one farmer put it, it doesn't grow in the silo and I can't get it in quick enough if I wait. So we all did what we were brave enough to do and waited. And kept waiting too. After 9 mills in the first three days of May, not a thing fell until 26th, when 14.5 mills fell over three days. Now the trouble with us farmers is we are an optimistic bunch. We need to be. So on the back of that sniff of rain most programs were completed. Catch was, it didn't rain again until the 23rd of June, and 30 mills then fell over seven days, giving us the third lowest rainfall on record for that month. July was an average month, and with dribs and drabs through the rest of the months, we ended up with 258 millimetres for the year. Well down on normal, but enough to at least cut the hay, albeit with a 36 foot swath, and enough to get the harvester out of the shed to blow the cobwebs and mice out and take off some chook wheat. So after these two rather longwinded posts, what are the silver linings? What possible benefit could we have gained from two of the worst years on record in our area? They say necessity is the mother of invention and it certainly rings true here. Our feedlot has been our lifesaver. Since starting in September 2006 we have depoted 350 000 sheep on behalf of exporters. It is hard work, but it is a handy paycheck, and something we may not have fallen into otherwise. Another sideline we fell into was capretto. At the height of the drought we had to sell ewes with young lambs. The agent who offered to buy the ewes was more interested in the lambs when he saw them. Turns out "milk lambs" are highly prised as a substitute for capretto (young goat). At the time there were people being forced to wean off their lambs early. We bought them, fattened them and delivered fifty a week into Perth butchers. In turn, this led us into the capretto market. We bought any feral goats that were too small for processors and fattened and delivered them into the same butchers who were taking the milk lambs. All up, we must have done around 4000 head in the first two years. Again, hard work, but good rewards. And once again, this led us into selling our own meat at the Geraldton Farmers Markets, as we were already doing weekly abattoir deliveries this fell right into our systems. same spot as the wind swept photo. Watching our farm blow away forced us to look at alternative pastures. Sub tropical perennial grasses were the answer. After four years of careful plantings and management, we now have around 800 acres established on our poorest soils, ensuring they will never blow away again, with another 160 acres going in this spring. Another silver lining in all this is between the feedlot and capretto, we saw the potential of pastoral stations. We could see the quality of stock coming into our depot, and started looking around, more tyre kicking than anything else. But we found one, and the bank liked it too. November 2009 we took over Gabyon Station, one that had been in the previous owners family for one hundred years. Talk about pressure. But Gemma's mother and father are out there now working twice as hard where it is twice as hot and twice as cold and absolutely loving it. In fact, we're not sure how we are going to get a chance to get up there. The final, and most important silver lining is what we learnt about ourselves. Stressful times create strains on relationships. Words were said and arguments were had. Why didn't we do this, or how come you did that? When there is no one else to blame it is easy to turn on ourselves. But we got through it. We adapted and coped and learnt more about ourselves then we would've otherwise. And I honestly believe the four of us are closer now then we may otherwise have been . Which will hold us in good stead into the future, because if we can survive that, we will survive anything. I don't know if you do, but I hope you do, understand how important your blog is Michael. One day, one post at a time you are showing Australians what it's really like. Well done! The pictures of the sand ... wow ... devistating, gobsmacked, wow. My philosophy is that you are never given more than you can cope with, it might be hard but it makes you a better person. I guess if farmers weren't optimists farming wouldn't happen because you would always be scared of the fact that rain won't come etc. The most moving comment from your story was the last paragrah. Trouble and strive can tear couples and families apart, but I was pleased to hear this tradegy bought you closer together. You want to what? How many?